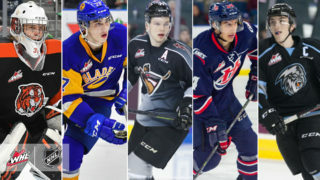 The Vancouver Giants would like to congratulate prospects Justin Sourdif, Tanner Brown, Cole Shepard, John Little, Braedy Euerby and Krz Plummer on being named to the shortlists for their respective provincial Under-16 teams ahead of the 2017 Western Canada U16 Challenge Cup. 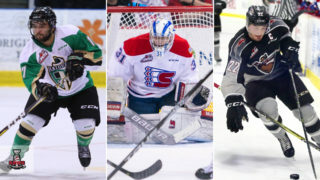 Sourdif, Brown, Shepard, Little and Euerby were shortlisted for Team BC while Plummer was on the Team Alberta shortlist. The Western Canada U16 Challenge Cup will take place in Calgary from October 17-22. 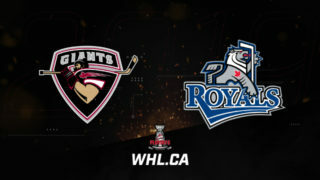 Giants prospect Alex Saretzky is slated to attend Saskatchewan’s selection camp next week. Sourdif, a Surrey native, played for the Delta Hockey Academy’s Bantam Prep team during the 2016/17 season. The 5’10”, 158lb forward amassed 32 goals and 34 assists in 29 regular season games and helped Delta to the CSSHL’s Bantam Prep Division championship game. Sourdif also took part in the 2017 U16 BC Cup in April, leading the tournament in scoring with five goals and four assists in four games while playing for the victorious Team White. Vancouver selected him third overall. Brown, a Kelowna native, scored seven goals and 22 assists in 26 games with the Pursuit of Excellence Hockey Academy’s Bantam Prep team in 2016/17. The 5’11”, 170lb blue liner also added four points in five playoff games, helping POE to the Bantam Prep Championship. Brown played at the 2017 U16 BC Cup, scoring three goals in four games for Team Green. The Giants drafted Brown at 24th overall. Shepard bagged 19 goals and 28 assists in 30 games with the Delta Hockey Academy’s Bantam Prep team during the 2016/17 season. 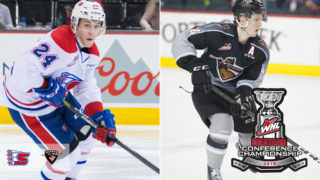 The West Vancouver product was a teammate of Justin Sourdif who Vancouver chose in the first round. Shepard added a goal and two helpers in five playoff games. The 5’8″, 142lb winger scored one goal in four games for Team Blue at the 2017 U16 BC Cup. 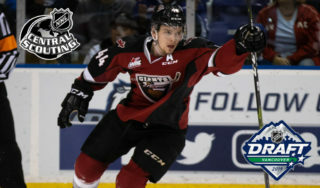 Shepard went to Vancouver at 33rd overall in the Bantam Draft. Little, a third round pick of the G-Men, played for the Shawnigan Lake School Bantam Prep team in 2016/17. During the regular season, the Parksville native led his team in scoring with 13 goals and 14 assists in 27 games. 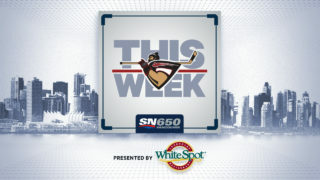 Little, who is listed at 5’11”, 171 lbs, went on to net five goals and two assists in four post-season games. He also went to the 2017 U16 BC Cup, scoring one goal in four contests. Euerby is from Delta and played for the Delta Hockey Academy’s Varsity Green team in 2016/17. He went 11-0-0 in the regular season with a 0.45 goals against average and a sparkling 0.970 save percentage. The 6’0”, 170lb netminder also led his team to the Varsity championship, amassing a 4-0-0 record in the playoffs. The Giants took Euerby in the fifth round. Plummer, who hails from Whitecourt, Alberta, scored eight goals and 13 assists in 27 games with the Pursuit of Excellence’s Bantam Prep team in the 2016/17 regular season. In the playoffs, Plummer tallied two goals and four assists in five games. The 6’0”, 195lb forward also played at the Alberta Cup where he scored four goals and one assist in five games for Team Northwest. Plummer went to Vancouver in the third round.